When Black and Decker trains new sales person they ask, "Why do people buy a Black and Decker Drill? "After all of the discussion about power, size, and battery live, the answer is simply, "Because they want a hole." Sugar is in the same situation. Activities.sugarlabs.org takes us in that direction. Activities.sugarlabs.org is a portal for uploading and download learning activities. Activities.sugarlabs.org is inspired by and shares code with addons.mozilla.org. Children's computers are tools on which they learn, work, and play. They should be able to customize them to their personal styles of learning, working, and playing. The activities portal makes it easy for them to personalize their Sugar experience. The Activities portal removes the central decision maker. How to best teach children is still an open question. None of us at Sugar Labs can confidently say, yet, what tools or activities will work most effectively for an individual child. Instead of blessing a particular set of activities, the Activities portal is a place for anyone to upload their favorite activity. If others find the activity fun and useful, they are free to download and install it on their own computer. Children, parents, and teachers can browse activities, seeing the popularity of an activity and reading reviews before downloading. The Activities portal helps focus the efforts of the community: Sugar developers can see what features are most popular and integrate them into the Sugar core. One of the motivation for free and open-source software development is "scratching your own itch." Developers write code to meet their own needs and passions. For many people, their child's education is a source of passion. "Having a child with needs that reach above and beyond those of a typical child is something that shapes a parent's heart, mind, and spirit. We read everything we could get our hands on, we carried him to therapy every day, and we did everything in our power to insure that he was given every opportunity he needed to thrive. As he grew, we began to see that computer programs did not seem to cater to the needs of kids like Quinn. Either they were far too young for him, and non-engaging, or they were far too old and frustrating for him. So, we decided to see what we could do to remedy the situation." We, as a community, can use the Activities portal to bring together the efforts of groups and individuals such as the Hall's and make their work available to learners everywhere. It appears Qimo is a for profit so what they are creating might be free, it seems it might be under their copyright (I didn't download and install and run it). "Why not use Sugar from the OLPC project? A: Sugar is a very good interface for the OLPC computers it was made for, but many of the design decisions and interfaces don't work nearly as well on standard PCs. 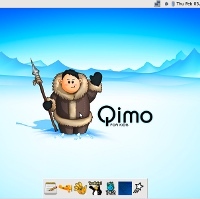 Qimo uses a customized XFCE interface to provide a fast, lightweight, and most importantly an easy to navigate interface that works well with standard computers, monitors and keyboards." dickey45 could you be more specific on the for profit part? customized Linux operating system that powers child-friendly computers. community developers along with custom configurations and artwork. repaired, wiped clean of their existing files, and installed with Qimo. area, including computers, monitors, printers, internal and external components. help improve and add to the suite of games included in Qimo. and low-income children by giving them fully-functional computer systems. receiving 501(c)3 status from the Internal Revenue Service. I couldn't find anyplace on the website that said it was gaining non-profit status. That is why I said that. As an autism advocate, I also found it weird that an organization would create yet another desktop. It's like re-inventing the wheel. And it is taking resources from other nonprofits that will do something with bigger backing. Relax it's not a competition. Success for Qimo is not failure for Sugar. Look I think projects Qimo demonstrate that the wheel is not being reinvented, look at the activities all common, minor tweaking with a UI is not reinventing the wheel.